Recently, Next Intent invested in a new OKK VC-X350 5-axis CNC machining center due to overwhelming demand from the Aerospace, Aircraft, Defense industries. This new machining center will join the 6 other OKK brand machine tools currently in use in their facility. Next Intent is relied upon to provide parts with very close tolerances for cutting edge industries, and this new machine will help them continue to do just that. Rearranging all of the machines around the shop was necessary to make room for the new CNC machining center installed last February. It was quite a feat to move all of these large machine tools in such a way that each could be most productive, but the increase in productivity was well worth it. This CNC machining center is ready for integration with an Automatic Work Changer and includes a 60-work piece capacity magazine. The extremely rigid VC-X350 features a work table that can handle hard metals like titanium. The president of Next Intent, Rodney Babcock, reported that the OKK VC-X350 5-axis machining center is an addition to their current OKK machine tool line that provides the features and flexibility required to meet customer demand. 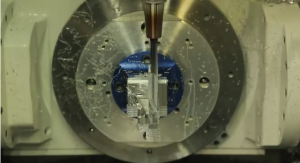 This includes 5-axis machining which allows five sides of a part to be machined at once. This is critical for accomplishing such close tolerances specs. He went on to explain that the company already has enough demand to keep the new machine in operation full time and the high quality and reliability of OKK machines tools are partially to thank. This leaves the possibility of further upgrades to or additions of new CNC machine tools in the near future just to keep up with demand. Aerospace, Scientific Research, Defense and Aircraft clients are among the industries that come to Next Intent with machining specifications that are close to impossible. Next Intent provides optional component assembly on top of mechanical and manufacturing support for the various projects. As a 9100 certified company, Next Intent has earned a reputation for quick understanding of client needs. They are also known for quick development of comprehensive manufacturing plans, which are promptly and accurately executed. OKK and Next Intent have shared a long-term relationship where OKK machine tools make up Next Intent’s main machine arsenal. Other machine tools manufactured by OKK include vertical machining centers, horizontal machining centers, blade centers, die mold machines, mass production machines and aerospace machinery.